If you’re looking for a SWEET deal, you’re in the right place. 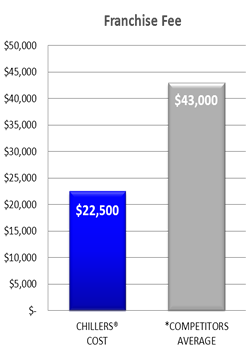 Our fees are drastically lower than our competition. 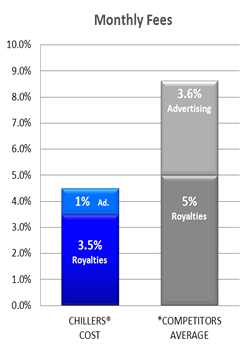 Others may claim to be low, but where else can you find a franchise fee of $22,500, royalties 3.5% of gross, and advertising fund of 1% of gross? This leaves you with a lower initial investment, lower operating costs, and a higher return, leaving more money in your wallet at the end of the day. We have years of successful hands-on experience and know-how. 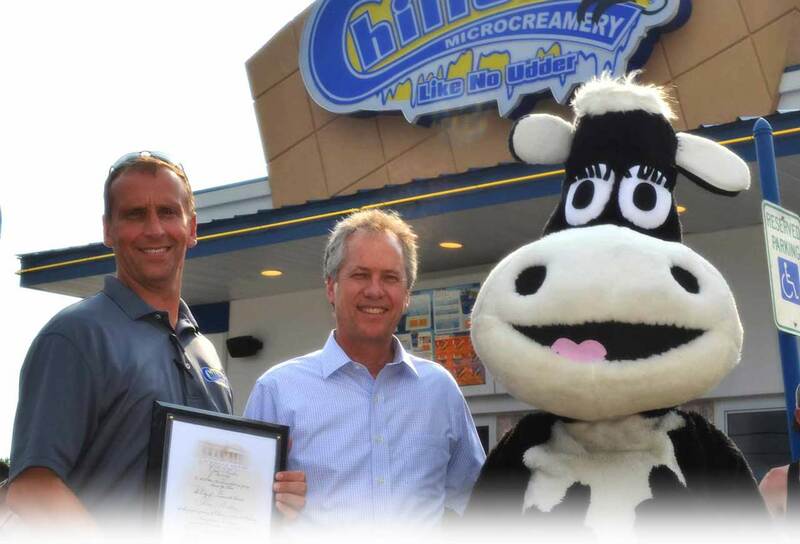 The Chillers family has been in the ice cream business for over 40+ years. Throughout those successful years, we have continued to use the same time tested recipes and formulas that give Chillers Ice Cream the unique and superior taste it has today. Chillers will go above and beyond to assist you throughout every phase of opening your restaurant, including: site selection, lease review, construction, purchasing equipment, employee hiring, owner/operator training, employee training, grand opening assistance, and 10 days of open to close on-site support when you go live. Once open, every Chillers® franchise receives continued support to assist in your operational and advertising needs. You will stay well informed with face-to-face communications, meetings, and store evaluations. Handcrafted, Hand-Dipped Ice Cream "Microcreamery"
Walk up to any Chillers location and chances are you will see a local owner making hand-dipped ice cream. We decided from the beginning to have the philosophy that, no matter how difficult it may be, we always make the freshest and creamiest ice cream possible. We make our ice cream in small, 3-12 gallon batches at a time, ensuring that when our customers choose our premium hand-dipped they’re receiving the freshest ice cream possible every day. We like to say, “From the cow to the cone in less than a day!” Is it simpler to order ice cream out of a warehouse? You bet! That is why most other companies do, but how is that fresh? That “delivered” ice cream is made in a factory, frozen, put on a semi-truck and shipped to a warehouse where it sits in a freezer until someone orders it. It takes a lot of hard work to make 12 flavors of handcrafted premium hand-dipped, but Holy Cow it is worth it! Below is a breakdown of how we stack up vs. the competition. * These graphs were created by averaging four competitor's fees in the frozen dessert industry.